Southeast Asia's regionally integrated, thriving food manufacturing and foodservice industries are driving an increasing need for dairy ingredients and cheese. The U.S. dairy industry has led the world in milk production growth for a decade and has triple the production of New Zealand and Australia. This enables the United States to help fulfill the needs of global food and beverage manufacturers and foodservice operators to help drive their businesses forward. Like their counterparts around the world, Vietnam's young and upwardly-mobile consumers are increasingly craving the creamy, indulgent taste of chocolates. The chocolate confectionery market in Vietnam recorded a 14.5% compound annual growth rate from 2009 to 2014 according to Euromonitor figures, growing from $33.2 million to $65.3 million during that span. Growth is projected to continue over the next five years, potentially reaching $85.9 million by 2019 as the number of chocolate-lovers multiplies. USDEC exhibited at the Food Ingredients Asia trade show, held October 15-17, 2014 in Jakarta, Indonesia.This is the largest ingredients show held in Southeast Asia, with approximately 80 perent of visitors from Indonesia and the remaining 20 perent from the rest of Southeast Asia. 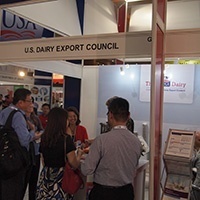 USDEC used the show as a platform to highlight what's new in the U.S. dairy industry and reinforcing the U.S. dairy industry's supply security advantages and great progress and eagerness in being a customer-centric business partner for Southeast Asia. 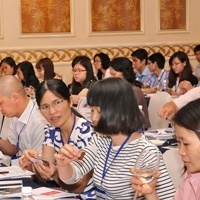 This included introducing USDEC's new Southeast Asia representatives while also communicating the exciting cost-saving, flavor enhancing benefits of permeate. Also highlighted were the U.S. dairy industry's rising supply of whole milk powder, tight spec skim milk powder and milk proteins, alongside the wide spectrum of whey protein ingredients. In conjunction with the show, USDEC also hosted a well-attended reception at the U.S. Embassy with the participation of over 100 Southeast Asian importers and end-users. The show as well as reception proved to be an effective platform to showcase the U.S. dairy industry’s advantages and evolving product portfolio.